Are you kidding me, self? It’s really been since December 4th that you last posted an update? Sorry about that, me. I, uh, have been really busy. First of all, we’ve been working like crazy on the game itself. Plus some other fun stuff related to the game. And, you know, Christmas and New Years. Shape up, self — no more of this “month and a half with no word” business. That’s a good way to get everyone to wander out of the room and forget about you. First off, happy new years to everyone! Hope you all had a good one… half a month ago. Next up: what’s been going on? Well, in general we’ve just been Making The Game, with lots of work going in all over the place. The combat model was a particularly tricky bit of business, but Keith just finished the initial implementation of that around noon today. I haven’t played with that much yet, but I’m excited about it. That is possibly — we’ll see — the single most complicated-to-code part of the game, so that’s good to have mostly done. Hey, when’s that private alpha starting? How about the public beta? That I’m a lot less certain on. We’re still looking at a May release, based on what I can tell now. I’ll be inviting a few people to partake in an early private alpha in February sometime. Currently my hope is to be mostly game-mechanics-feature-complete (not content-complete, and not with niceties like tutorials or multiplayer yet) in about 2-3 weeks from now. I’ve been testing as we’ve progressed, but I’m really going to start beating the screen in on the game at that point. Once I’m happy with stuff to a certain degree (one of those “you know it when you see it” things), then I’ll see about those alpha folks. We’ll have a couple of weeks with just a small number of alpha folks, and then probably go to beta around the start of March. Ish. So! Let’s talk about some stuff. Side note: every image in this post (logo aside) is a direct screenshot from the game. There are 14 factions overall, each one a different alien race. None human. When you start the game, you choose one of those races to be. Only 8 of them can be chosen from, the others are always AI-controlled. In multiplayer, each player chooses one of those 8 factions. When the computer is controlling a faction, it works completely differently than if a player were controlling it. When computers control factions, the factions use completely different buildings than any other computer faction, and than the player. 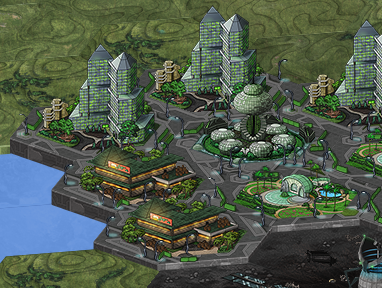 Every human-controlled faction has pretty much the same set of buildings, but there are a bunch of other things that vary by faction for the player. 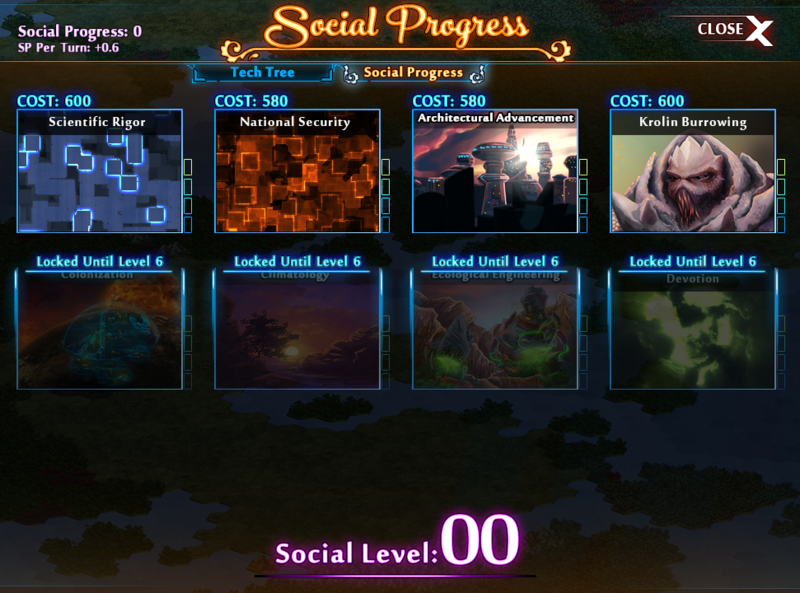 Also among those are a unique Social Progress Category for each of those 8 player-controllable races. There is a whole bunch else to say here, but it’s hard enough as it is. Why Are Buildings Different Between The Computer And Human Players? The human-controlled race(s) are arriving very very late to the party on this planet. All the computer-controlled empires are already well established and pretty stable. Your technology stinks. You and your colonists had your memories mostly wiped, and the same happened with your computer. Aspects of your former culture do remain, however, and you can find more things by studying the ship’s computer. The ship computer did intercept some ancient transmissions from Earth, and since it didn’t have proper architecture and technology to pull from your actual race, it’s pulling a lot of that from Earth instead. You’re having to quickly rediscover the basics of biology and advanced things like ectogenesis chambers, all in short order. The computer-controlled races already know all that stuff. They exist on a whole other level of technology from you, at least in the early game. Aka, they never share your tech tree, ever. There is the equivalent of tech trading, but that’s a story for another day. On the human side of things, a super-robust SimCity-like empire is something I greatly desired. But it’s hard to make AIs play those well. And it’s not particularly gratifying for players to even see the AIs just do the same things that the players are doing. Art was also a problem. I wanted tons of buildings on the human side, and needed tons to make the SimCity-style aspects work. But that would make all of the races look very much the same in terms of their cities, which is dull dull dull. And if it didn’t then the art costs would be sky-high. Even if the cost wasn’t an issue, making things really alien makes it super confusing for players with that many buildings. 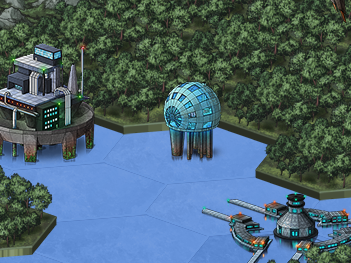 Ergo, the solution was to make the player buildings more inspired by Earth stuff that is familiar, but with sci-fi twists. While at the same time throwing out the book and letting each AI faction be completely unique and utterly alien. Not just from the player, but from one another, too. Ooh, suddenly that’s way more fun. There are a lot of benefits to doing things this way, gameplay-wise. It really lets me set up things so that they are very deep for you as a human player on the citybuilding/empire-building front, and so that each of the AI-controlled factions is essentially playing a different game from you… and each other. It’s also fitting for the “new kid on the block in an established neighborhood” sort of theme. Above you can see what I mean about the alien races. Those are some of the Thoraxian buildings. It’s extremely personalized to their race, and utterly alien. I just love how those turned out. But you never control those yourself, that’s just one of the enemies you run into. (Usually with their own terrain spreading out around them, but this was just a test setup looking at the tunnel entrances). Why are you building a lot of the citybuilding stuff? In a 4X game, there has to be some sort of larger strategic purpose to buildings. It’s not like SimCity, where you can just build for the sake of building. Well… I don’t like that. Usually when that’s the case, it really cramps creativity AND it makes everything overly focused on the military. So! We have a concept of Social Progress here. This is a really important aspect of the game, and you basically earn a certain amount of SP each turn. When you get enough, you can choose a category in which to add a level, or you can skip that and wait until you have enough SP for a different category. The cost of each category varies slightly to start with, but also goes up based on both how many levels you have overall and in that category. There are 4 levels possible per category, and so level 36 is the maximum overall level. You’ll have to click into the above image to see that one fullsize. Also I should note that some of the little portrait icons there are temporary right now. Specifically Scientific Rigor, National Security, Devotion, and Krolin Burrowing. Those four are just stand-ins until Blue can finish painting the other ones (she’s working on that gradually while also working on a million other things, same as the rest of us). Actually, after you have completed all 8 of the main social progress categories and thus achieved level 32, a 9th category opens up. This one is called Transcendence, and it’s one that you would ONLY even attempt if you were going for that victory condition. 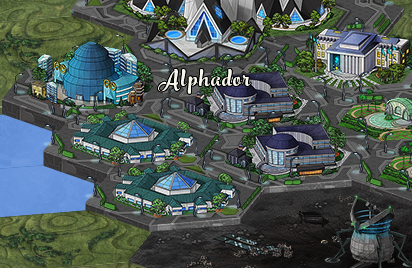 It’s something that requires a very strong SP throughput, aka very well-designed cities, and once you start down that path of Transcendence the Thoraxians (them specifically) get… riled up. So it’s a pretty interesting time, and you better be ready for what comes your way when you even attempt that. The tech tree is not nearly complete, but at this point there are 74 techs defined for it. 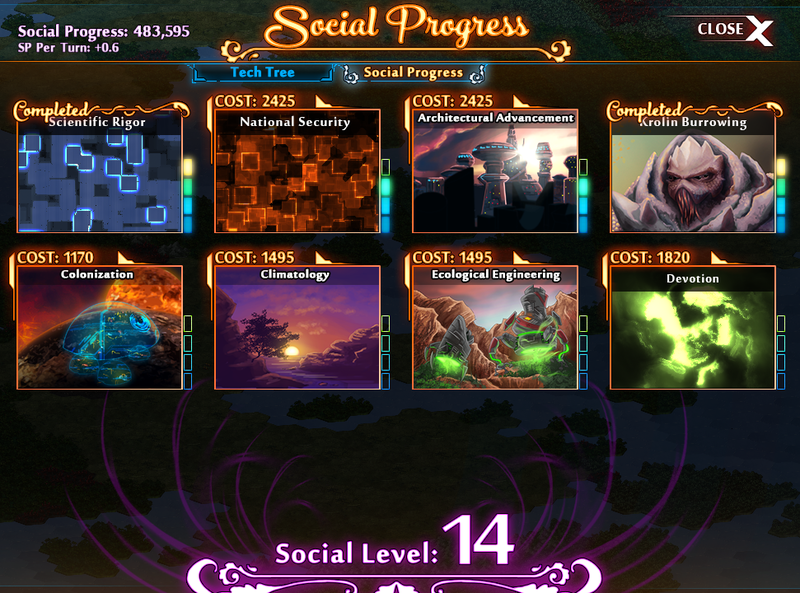 The sheer size of the tech tree can be daunting, so some of that is hidden by your social level early in the game. Remember how I said the social level was important? This is one of the many reasons. You also can’t have more than one city in your empire until you start gaining levels in Colonization, incidentally. The little purple gavel with a number by it shows you what social level you have to reach before stuff beyond that opens up. Even right at the early part of the game there are some important ways you can differentiate yourself. How exactly you make your first footprint into the world has a lot of variety, and that leads into the middle game of how you establish your capitol city and the basics of your empire. Which of course leads into the late game and how you mature your empire into something that can truly compete on the global stage as a frontrunner, and how you turn that into one of the victory conditions. Personally I’ve been finding it really refreshing not to have an overwhelming number of options at the start, and then see that blossom into a plethora of options-that-would-have-been-overwhelming as the game progresses. And it’s not a “newbie mode” sort of thing, either. Each phase of the game is something you’ll actually think about, not just do on autopilot. The “screenshot” above is actually three screenshots shoddily patched together. It was the only one I modified in any way, aside from cropping the others to fit this post. But the tech tree is wide enough that there’s not any other way to do it. That’s showing a view with all the techs unlocked. Be sure to click it and then zoom in if you want to see it in full resolution. What that part of the tech tree represents is more or less getting to the “late middle game,” I would say. By that point you have your empire really well established, and you’re able to use all of the core buildings and services that make up an efficient and effective empire. Although depending on your goals, you won’t have unlocked all of those, and you’ll still be in the late middle game anyhow, ready to move on to some other techs that take you more into the late game. Those are not yet implemented in the game. All right, there’s a lot more that I’d love to tell you about, but this post is already really long. And I do have some things that I was hoping on finishing up today before the weekend hits. ;) I’m super stoked about this game, and as we head more into the testing/refinement stage of this, I will be sharing more frequently than I have been lately. Click here for the official forum thread relating to this post. That’s it Chris, I’m taking the milk away! Now just try to enjoy your cookies! Any good news coming soon :?